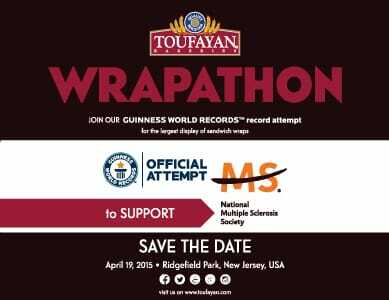 Toufayan will make a GUINNESS WORLD RECORDS® Official Attempt to break the record for the Largest Display of Sandwich Wraps at this year’s Walk MS NJ event, at 10:00 AM on April 19th at Overpeck Park. Drawing on our line of 10 unique varieties including whole wheat and gluten-free flavored wraps, Toufayan will create more than 700 unique sandwich varieties with the help of our friends from the neighborhood and the National MS Society with their amazing volunteers. Come out to watch us break the record right before your eyes! The Wrapathon starts at 10am in Ridgefield Park. Tune in to 95.5 WPLJ to hear the live radio broadcast of our record breaking attempt.